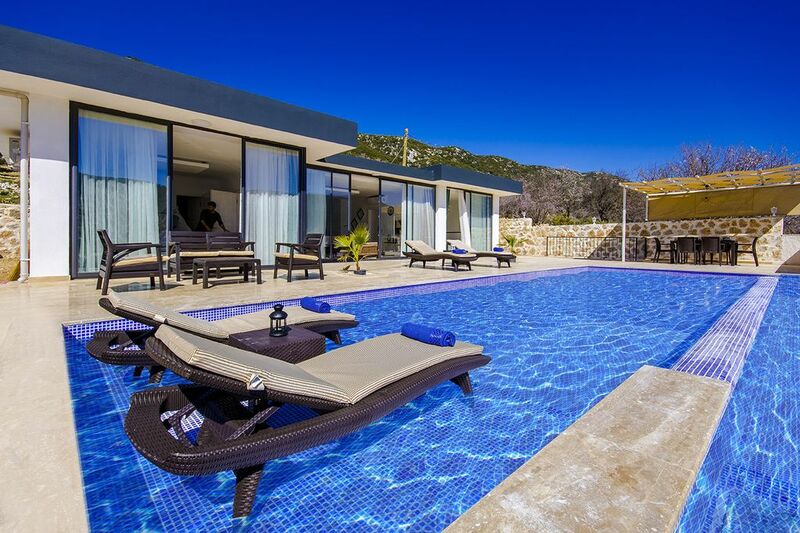 This brand new 2 bedroom villa is located in Saribelen Village, in the foothills of the Taurus Mountains, some 15 km from the sophisticated resort town of Kalkan. It is an ideal for those guests looking for a relaxing stress free environment to enjoy their holidays. The accomodation consists of a large open plan lounge / kitchen / dining area, which opens directly on to the pool terrace, and one double and one twin bedroom, both with en-suite bathrooms. The pool is 8.5 x 3.5 metres, and has a depth of 1.5 metres. THe spacious pool terrace will be screened to ensure privacy around the pool. The villa has wi-fi internet and parking space for one vehicle. Due to the remote nature of the location the use of a vehicle would be essential when staying at this villa.